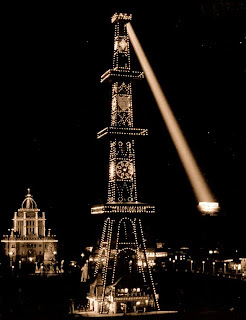 The centerpiece of the California Midwinter International Exposition was the 266-foot high Electric Tower. 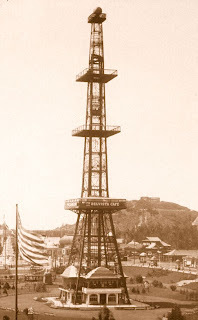 Designed by Leopold Bonet, the tower was constructed entirely of steel and stood at the center of the fair's Court of Honor. During the day the structure served as an observation tower, containing three platforms accessible to the public by an Otis electric elevator. 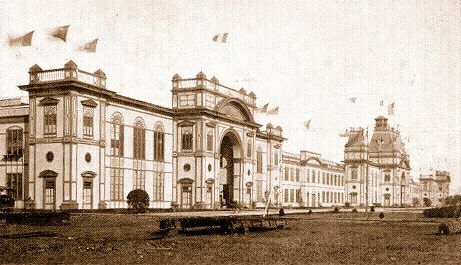 At the ground level, in a Moorish style pavilion, were located elevator ticket-booths, as well as a souvenir & snack shop. The first level, at 90-feet high, contained a restaurant named the Belvista Cafe. Above the restaurant were located two higher observation platforms, where breathtaking views of San Francisco bay, the Golden Gate, and the Pacific Ocean could be had. The top level was not accessible to the public, and contained the World's most powerful searchlight. By night the Electric Tower truly lived up to its name. Covered with 3,200 multi-colored incandescent electric lights, the tower glowed brightly in rainbow hues. 1,000 lights were used to outline the tower, another 1,000 for fixed decorative-patterned lighting effects, and the remaining 1,200 lights created changing geometric shapes, made possible by a rotating specially-coded metal cylinder. Exposition visitors were amazed at how the lights created numerous changing shapes & patterns. The searchlight, at the top of the tower, randomly highlighted various landmarks in the vicinity.....from the cross atop Lone Mountain, to the Sweeney Panorama located on Strawberry Hill. The tower was to be demolished at the close of the exposition but remained standing until January of 1896, when John McLaren, Superintendent of Golden Gate Park, had it dynamited. The Rideout Fountain now occupies the site where the Electric Tower once stood. I heard somewhere that couples liked to make-out in various spots in the dark park at night. And that the location of a particular couple would be secretly told to the guy who operated the spotlight on top of the tower -- and that he'd be casually moving the light around in a circle or something, but then quickly would shift location and zoom over to where the couple were smooching, and spotlighting them -- surprising them and drawing attention to them from other folks.